Cars, who needs them? It takes true grit to motor to work by mass transit. Keep your commute green and chic with nine of our favorite eco-friendly travel essentials. From woven linen pants that keep your perambulations unencumbered to cheery zippered pouches that sort and color-code your on-the-road paraphernalia, these planet-friendly selections will help weekday warriors strap-hang in style. This series is brought to you by Nordstrom.com: Think Less Buttoned-Up—It’s a New 9 to 5. With its oversized collar, cropped hem, and exposed zipper along its spine, Fin Oslo for ASOS’s organic-cotton jacket speaks volumes in an understated way come rain or shine. Daubed with pale washes of amaranth, chartreuse, and cobalt, Trina Turk’s “Flora” blouse is the gray-day antidote you seek. Made in the United States from a blend of silk and spandex, the sleeveless topper slips easily over the head and fastens neatly at the neck with string ties. Nothing says spring more than crisp white linen. Eileen Fisher offers a slim ankle trouser, cinched tidily at the waist, that’s modern and refined without appearing stuffy. 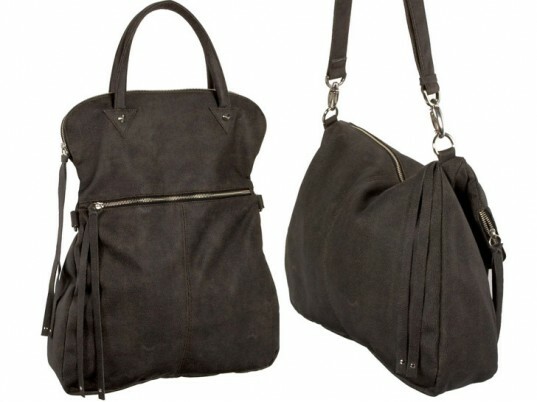 Swung over your shoulder or held like a tote, Cri de Coeur’s capacious carryall isn’t short of options. Made from vegan leather and lined with organic cotton, the shape-shifting Charlie folds over to half its size or expands in full to double your pleasure. Hoofing it on stilettos is the quickest route to podiatric ruin. If flats are a sacrilege, try the stability of a wedge, instead. Coclico’s T-strap platform, derived from vegetable-tanned leather, sustainably harvested wood, and biodegradable natural rubber, will stand you—and your toes—in good stead. Portable, lightweight, and profoundly useful, a handkerchief is an itinerant’s best friend. Available in a black or turquoise aquatic print, Lina Rennell’s organic-cotton square is the perfect size for stemming sniffles, deflecting odors, or fashioning emergency tourniquets on the move. If the inside of your purse bears an uncanny resemblance to the aftermath of a Barneys Warehouse Sale, don’t lose your head. Keep your MetroCard, office ID, loose change, and makeup corralled and color-coded in BAGGU’s brightly patterned pouches and rummage no more. L.A. designer Rooni Kappos uses German glass beads from the ’20s and ’30s to craft her wearable works of art. Strung on 24-karat gold findings, the results are distinctly modern and undisputedly one of a kind. Rush hour on a packed subway would rattle even the Dalai Lama’s inner calm. 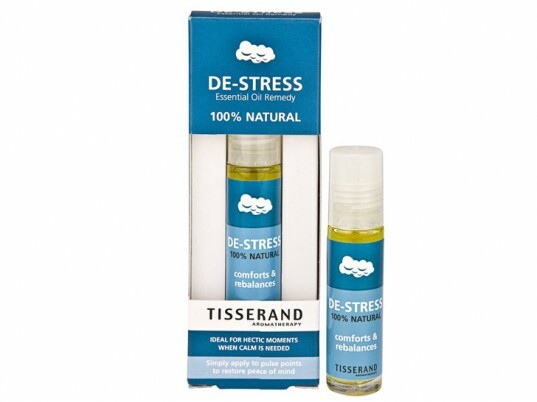 Maintain your Zen with Tisserand’s De-Stress Roller Ball Remedy. Packed with the molifying scents of patchouli, orange, and rose oils, the all-natural and vegan-friendly formula glides easily over your pressure points for an instant pick-me-up. Originally published on April 26, 2010. I've been eyeing that bag forever. Those shoes need to be on my feet!! Hot look for those on-the-go girls Jasmin! you would have to "strap-hang", you'd never want to sit anywhere on mass transit in white pants. Note into the trousers (or trousers at all, really) but love, love love the jacket! 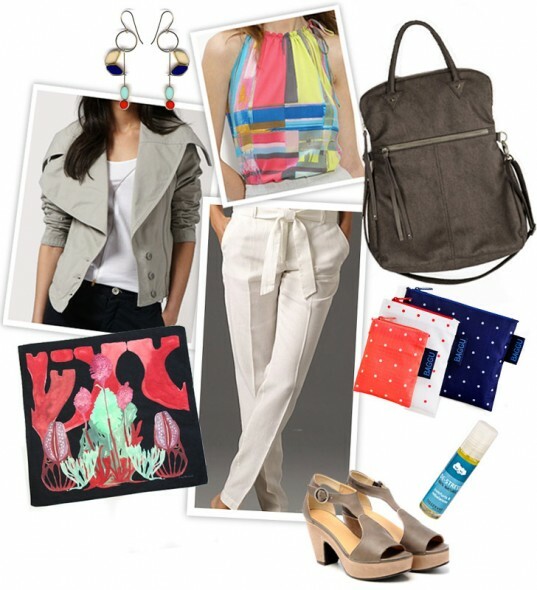 SHIRT Trina Turk Flora Silk Top $198 TRENCH Fin Oslo for ASOS Large Collar Jacket $71.72 PANTS Eileen Fisher Slim Trouser With Tie Belt $109 BAG Charlie by Cri de Coeur $239.25 EARRINGS Ronni Kappos $185 HANDKERCHIEF Lina Renell $54 POUCHES S Dots by BAGGU $8 SHOES Coclico Chula Piombo $350 AROMATHERAPY Tisserand De-Stress Roller Ball $8.10 This series is brought to you by Nordstrom.com: Think Less Buttoned-Up—It's a New 9 to 5. With its oversized collar, cropped hem, and exposed zipper along its spine, Fin Oslo for ASOS's organic-cotton jacket speaks volumes in an understated way come rain or shine. Daubed with pale washes of amaranth, chartreuse, and cobalt, Trina Turk's "Flora" blouse is the gray-day antidote you seek. Made in the United States from a blend of silk and spandex, the sleeveless topper slips easily over the head and fastens neatly at the neck with string ties. Nothing says spring more than crisp white linen. Eileen Fisher offers a slim ankle trouser, cinched tidily at the waist, that's modern and refined without appearing stuffy. Swung over your shoulder or held like a tote, Cri de Coeur's capacious carryall isn't short of options. Made from vegan leather and lined with organic cotton, the shape-shifting Charlie folds over to half its size or expands in full to double your pleasure. Hoofing it on stilettos is the quickest route to podiatric ruin. If flats are a sacrilege, try the stability of a wedge, instead. Coclico's T-strap platform, derived from vegetable-tanned leather, sustainably harvested wood, and biodegradable natural rubber, will stand you—and your toes—in good stead. L.A. designer Rooni Kappos uses German glass beads from the '20s and '30s to craft her wearable works of art. 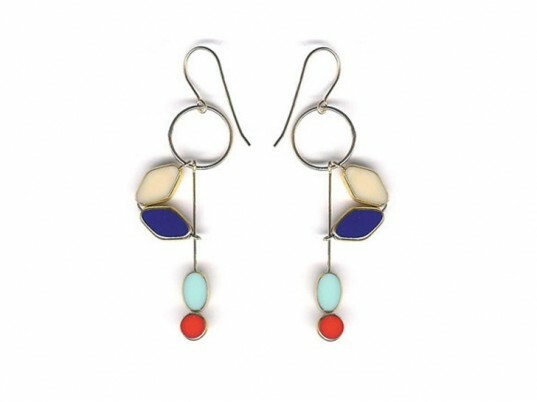 Strung on 24-karat gold findings, the results are distinctly modern and undisputedly one of a kind. Portable, lightweight, and profoundly useful, a handkerchief is an itinerant's best friend. Available in a black or turquoise aquatic print, Lina Rennell's organic-cotton square is the perfect size for stemming sniffles, deflecting odors, or fashioning emergency tourniquets on the move. If the inside of your purse bears an uncanny resemblance to the aftermath of a Barneys Warehouse Sale, don't lose your head. 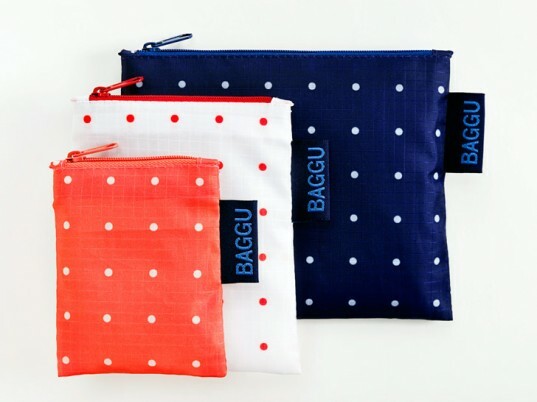 Keep your MetroCard, office ID, loose change, and makeup corralled and color-coded in BAGGU's brightly patterned pouches and rummage no more. Rush hour on a packed subway would rattle even the Dalai Lama's inner calm. Maintain your Zen with Tisserand's De-Stress Roller Ball Remedy. Packed with the molifying scents of patchouli, orange, and rose oils, the all-natural and vegan-friendly formula glides easily over your pressure points for an instant pick-me-up.